What is Persian Qanat or Kariz? Persian underground banks or Qanats are one of the fascinating water extraction and shifting system which has made living in the arid regions possible and added a great value to the Iranian ancient culture. Qanat is the Arabic term of this system, its Persian name is Kariz or Kahriz, meaning the water channel. About two thousand years B.C. Qanats were invented by brilliant Iranians to pull up the water from underground aquifers only with the use of gravity. Qanats consists of one mother well and some other wells next to each other connected by a Channel. Water flow from wells to the channel and then the Farms and villages, for the agricultural and daily life use. These channels protect water from vaporization by heat and sun, they have several holes in a row which let the fresh air circulation occurs. As a result of airflow, the workers could easily reach to the channel, breathe easier down there and the water is also protected from spoilage. Though Qanat system was invented by Iranians, people from other parts of Middle East, Arabia, Qafqaz, China and even North Africa have used this system in their land. In July 2016, UNESCO announced 11 Persian Qanats, locating in Iran, in the world heritage list. The deepest, biggest and oldest Qanat in Iran, locating in Gonabad village in north east of Iran, Khorasan province. This Qanat dates back to 2700 years ago and because of its extraordinary depth of 35 Kilometer and more that 470 wells it’s still one of the important water sources in the Gonabad region. This Qanat locating in Ferdows, near Mashhad consists of 15 wells with 2 springs. It’s construction dates back to the Sassanid Era. About 3000 years ago, Persians in central Iran constructed the longest Qanat of Iran. Zarch Qanat, rooting from the Fahraj village in the south east of Yazd, passes through Yazd city and ends in Zarch city in the north part of Yazd and has 120 kilometer length. This old Qanat with more than 2000 shafts distributes the water to different areas and regions. Houses in Yazd, Jame mosque and even the Amir chakhmaq complex have been constructed on the shafts of Zarch Qanat to easily access to water. You can visit a part of this ancient and old Qanat under the Yazd Jameh mosque. The Mother Well of Hasan Abad-e Moshir is located in Mehriz city in Yazd province, the channels of this Qanats passes from Pahlavan Pour Garden and continues its way toward Yazd. Pahlavan Pour is one of the Persian Gardens registered as world heritage sites, you can enter the Qanat through this Lovely garden. This Qanat in Arak, Markazi province is built in the end of Qajar period. Ebrahim Abad is the only Qanat with cane shape and the tunnel gets wider and wider, this makes the Qanat a mysterious place. Maybe this is the reason why it’s not accessible to visit. Vazvan Qanat was built on Sassanid Era in Esfahan province, near Vezvan city and continues to the Meymeh. This Qanat has an underground dam which stores the water in winter (around 4 months), to provide the agricultural fields with more water in springtime. There is a 2000 years old Qanat in Mozdabad city, Esfahan Province. This Qanat has two branch of warm and cold water and 3 dams. In winter locals put fabric in clay urns and they put the urns in some holes on the dams. Then, when water pressure increased the urns expanded and the dam were closed. In spring they broke the urns to let the water behind the dams flow to the fields. The only Two floored Qanat of the Earth is Moon Qanat in Ardestan city, Esfahan Province, the water running in these qanats flow so close to each other but will never mix in the channels. The Mother Well of Moon Qanat is called “Twin Well”, since its two well with some mutual shafts. This Qanat is well located in road Yazd- Kashan and Esfahan- Kashan. It is said that the upper Qanat has more fresh and cool water than the lower one. These two Qanats start their journey in Mahal quarter of Ardestan and will join together in Seyedan quarter of Ardestan. 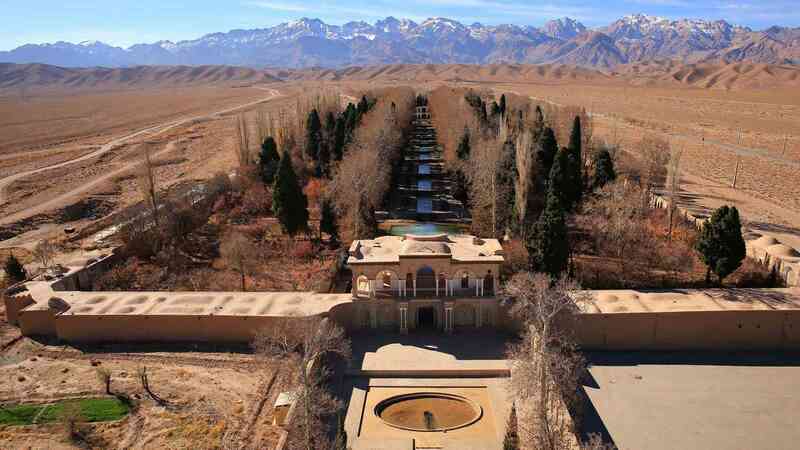 Gohar riz Qanat in Kerman Province, consists of six Qanat chains, 129 wells and is considered as one of the longest Qanats in South Iran. This Qanat is registered because of its water supply found out to be a Fault. In south area of Bam, near Baravat city, there are two short Qanats called Ghasem Abad & Akbar Abad near Bam, which are known to be twin with the same route with a distance of only 10 meter. Where to visit a Persian Qanat? Based on your travel route in Iran, you can choose a UNESCO world heritage Qanat which is in your route, accessible and fun to visit. FriendlyIran team will help you in choosing the closest Qanat.